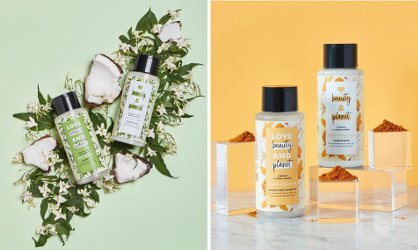 Two of the newer scents from the reasonably priced hair and body care brand Love Beauty and Planet: Coconut Milk & White Jasmine (left) and Turmeric & Tonka (right). Other fairly recent additions include Rosehip & Patchouli and Indian Lilac & Clove Leaf. Do comment if you've smelled any of them! 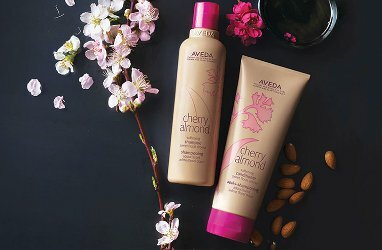 The story is that Aveda's Cherry Almond Softening hair products were discontinued ages ago, then last year they brought them back, then they sold out and Aveda started a waiting list. At the moment, they're back in stock. "Certified organic coconut oil and shea butter deeply condition delivering superior slip and effortless detangling. Formula with naturally-derived cherry blossom extract and sweet almond oil restore softness and shine from roots to ends, leaving your hair feeling touchably soft and full of weightless bounce. Infuses hair with a sweet, juicy floral pure-fume™ aroma containing 38 flower and plant essences inlcuding tonka bean, certified organic orange and ylang ylang." Not done with rose shampoo just yet, and this one is Jessica's favorite: Carol's Daughter Cactus Rose Water Sulfate-Free Shampoo ("This gentle cleanser, together with our conditioner and volume spray, help to remove excess oils and impurities without drying. 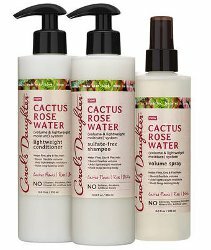 It’s blended with our Cactus Rose Water recipe and helps give fine, flat hair a succulent, fuller appearance; $11.49 for 355 ml at Ulta). There is also a matching Lightweight Conditioner and Volume Spray. And still more budget options to rose up your hair: Pantene's new Rose Water Pro-V duo. 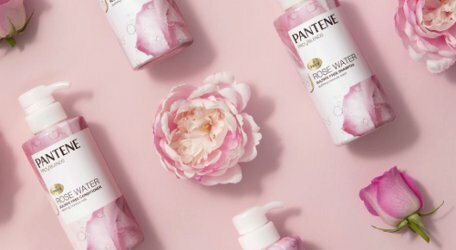 "Pantene’s Rose Water sulfate-free shampoo gently cleans and soothes dry hair by infusing it with the nutrients hair needs to hold onto moisture. The Soothing Moisture Wash with Rose Water Pro-V Blend is a rich, creamy formula free of sulfates, parabens, dyes and mineral oils. Dry, dull hair turns into shiny, touchably soft. Pantene’s Rose Water sulfate-free conditioner provides instant relief for dry hair by replenishing hair inside and out with a blend of moisturizing nutrients. The Restoring Moisture Milk includes rose water, antioxidants, and our legendary pro-vitamin B5 in a creamy formula free of sulfates, parabens, dyes, or mineral oils." Both items are available in 2 sizes, 300 ml for $5.99 or 530 ml for $9.99, at Target. 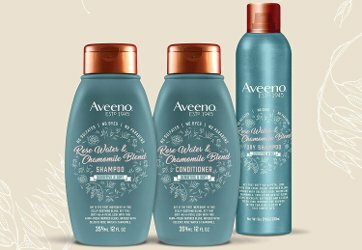 More budget options for rose-scented hair: Aveeno's Sensitive & Soft + Rose Water & Chamomile range. Available in Shampoo ("Oat is the first ingredient in this scalp-soothing, farm-fresh inspired shampoo blend infused with rose water and chamomile for sensitive skin and soft cleansing. Softening and soothing properties for daily use makes it the perfect blend for fine or fragile hair. Sulfate free shampoo, no dyes or parabens"; 354 ml for $6.99 at Target), Conditioner (354 ml for $6.99 at Target) and Dry Shampoo (238 ml for $12.69 at Amazon).